See below for a handy list of my reviews, with links. They’re all books and products relevant to adoptive and additional needs parenting. If you represent a brand and there’s something you’d like me to review, please see my media pack for more information including stats and demographics. Which of us, despite our best therapeutic parenting intentions, hasn’t occasionally (or more than occasionally) lost the plot with our children when things have all gone pear-shaped? Ellie Jelly and the Massive Mum Meltdown is ‘a story about when parents lose their temper and want to put things right’. I tested out three games with help from Joanna (age 9) and Charlotte (age 7). Read the review here. From food issues to advocating for your child, via handling meltdowns and battling with paperwork, The Special Parent’s Handbook addresses everything with the humour and practical advice that comes from hard-won first-hand experience. Whether your child’s issues are physical, mental, or emotional/behavioural, there is something here for you. I reviewed the July 2017 BuddyBox from The Blurt Foundation, which is a collection of self-care treats. This month’s theme was ‘All at sea’. Is the BuddyBox worth a £21.50 investment in your self-care? And what’s inside the box? Confessions of an Adoptive Parent is an ideal book for Christian adoptive parents who have found themselves, and maybe their faith, battered by the demands of parenting their children and fighting to get the support they need. Mike Berry writes as someone who lives it all too, knows how soul-destroying it can be, and has some tried and tested survival strategies to share. I had laughed and cried with recognition at the stories being shared within the first three pages. It is so authentic and raw and heartfelt that I loved it immediately. Caring for a family member is often hard work, usually unpaid, and can be overwhelming. There are hundreds of books about caring for people and doing a better job of it and all the things the person being cared for needs from you. This book is about having a life outside of that role so you don’t spontaneously combust under the pressure.. In short: self-care for carers. With a sense of humour. I reviewed The Secrets of Successful Adoptive Parenting for the current issue of Adoption Today, the magazine for members of Adoption UK. 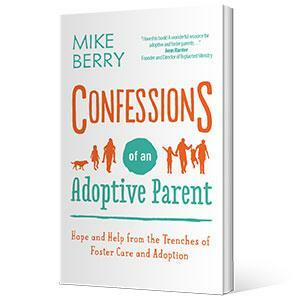 This book is a thorough guide to how to manage many of the challenges of adoptive parenting. It’s primarily aimed at helping adopters who are still pre-placement to prepare appropriately for the task ahead of them. And it does this job well. Barb has autism, and Lois is her therapist. Neurodiversity is their story. And it’s great. This book is a romp through the authors’ various neurodiverse experiences, both personal and professional. These include autism (this is the main focus of the book), ADHD, anxiety, dyslexia, and being gay. At times it was deeply moving, but it is also very funny. Their sense of humour is on display throughout the book. They have a lot of fun with tales of their experiences, anecdotes from therapy, brilliant success stories from Lois’s other clients, and just being generally amusing. I reviewed this book as part of my participation in #tpbooks, the Twitter-based therapeutic parents’ book club. It’s practical and realistic, and I’d recommend it not only to parents but to schools, and anyone who provides childcare for adopted children. I often feel that storm analogies are an appropriate way to describe our family life. With two violent children rampaging about we lurch from one cyclone to the next. How much more so must this be the case when you find yourself parenting adopted teenagers with all the added hormones, identity issues and social pressures that this involves? So to find out what we are in for in another few years, and to better understand my friends who are already in this stage of parenting, I read Parenting in the Eye of the Storm: The Adoptive Parent’s Guide to Navigating the Teen Years. I checked out the ease and efficiency of the online shopping process, compared Splosh’s prices and eco-friendliness against my usual cleaning products, tested everything out, and got very excited about the smell of Splosh’s pomegranate washing-up liquid. My review of this DVD comes with a large amount of sarcasm. It’s not specifically targeted at adoptive families but it does claim that the techniques will ‘calm any child’. I am extremely skeptical about this claim, but the DVD is good for a laugh if you have an hour to spare. The premise of this book is that we can improve communication with our children by going about the whole business a bit differently. It’s not adoption-specific, but nor is it full of the sort of advice that is unhelpful for adoptive families (the sticker charts and naughty steps stuff). Adopted children are mentioned as having benefited from this style of parenting, and it’s easy to see why, as it is mainly about being very attentive to children’s emotions. I look at how the book applies to our family life, including the children’s responses to some of the techniques such as drawing their feelings and describing problems. Read the review here. This narrative forms the foundation of the devotional and the Bible verses and pontification about the theology of adoption are slotted in around that. It works.